Marrying someone seems rather interesting and fascinating at first, but marriage brings a lot of difficulties as well that one may or may not have thought about in the first place. American musician Flavor Flav is happy his married life is going smoothly with wife despite all the odds they faced down the road, yet they persevered through all that. Today we'll be talking about their personal lives and find out the secret for a successful marriage. Flav has always been very busy with his career and that's why he never talked about his personal life in the public but during one of the personal interview with Steve Harvey, he gave us a small glimpse of his otherwise secret personal life. In the interview, he is doing fine in his marriage and together with his wife, he hurdled all the problem with ease. Though at times Liz can be quite chilling at times. Well, you can see he was pretty chilled out during the interview and that's all because of their patience and strong bond. But it wasn't always like that as the pair went through a rough patch some time back. Back in 2013, both of them went on VH1's show, Couple' Therapy. In the show, his fiance Liz said how her boyfriend signed the contract papers of a dating show without her permission. At that time the pair was already engaged. They got engaged in 2008 and were thinking about taking their relationship to the next level until this happened. As if that wasn't enough, Flav reportedly chased Liz's son with a knife at Flavor's in Las Vegas. He himself he threatened the boy and if found guilty, he would've been serving 12-years behind bars. But he later reconciled with his wife and her son and the court sentenced him to only four months violence counseling and probation. The pair shares one son between them named Karma Drayton. He is also father to additional six children from his previous relationship with Karen Ross and Angie Parker including Dazyna Drayton, Kayla Drayton, Shaniq Drayton, Quanah Drayton, Jasmine Drayton, and William Drayton. 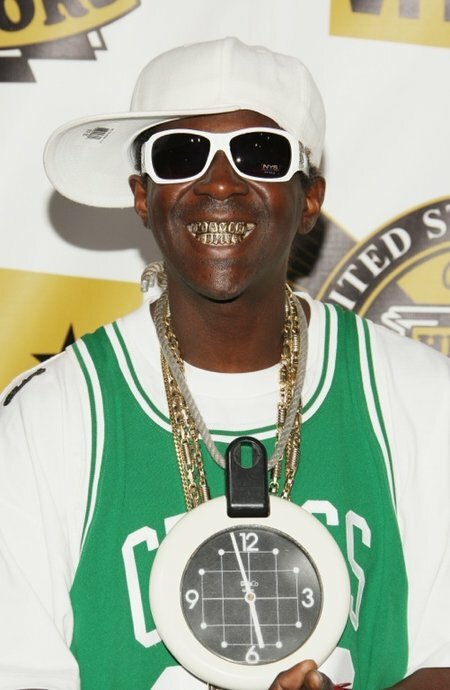 Flav was in and out of the jail for burglary and robbery since the time he dropped out of school in grade 11. He spent 30 days in jail and lost the custody of his children with Karen Ross as he was pleaded guilty of assaulting her. He was charged with attempted murder for shooting his neighbor and imprisoned for 90 days in 1993. It was the same year he was charged with domestic violence and substance abuse. He was arrested near Las Vegas for driving under the influence and speeding on 21 May 2015. Born on March 16, 1959 (age 58), in Roosevelt, New York, United States. He is the son of Anna Drayton, William Sr. He used to sing in Church. He went to Adelphi University. He became famous after creating the rap group in 1984. Def Jam executive signed both Chuk D and Flavor in 1986. He released his first album in 1987. He made his television debut in the show, The Surreal Life. He is the owner of the restaurant Flav's Fried Chicken. His net worth is $3 Million as of January 2019.